Discussion in 'Q&A' started by sandgrown, Mar 10, 2018. I see The Big One is widely disliked on here, and I can see why. It's a big first drop and then it's pretty nippy in places, but doesn't offer much in terms of adrenaline. However, I am still something of a fan of the first drop, and I remember it being fantastic when it first opened. Sometime into the first or second season I remember some changes being made to it, and the ride suffering generally as a result. 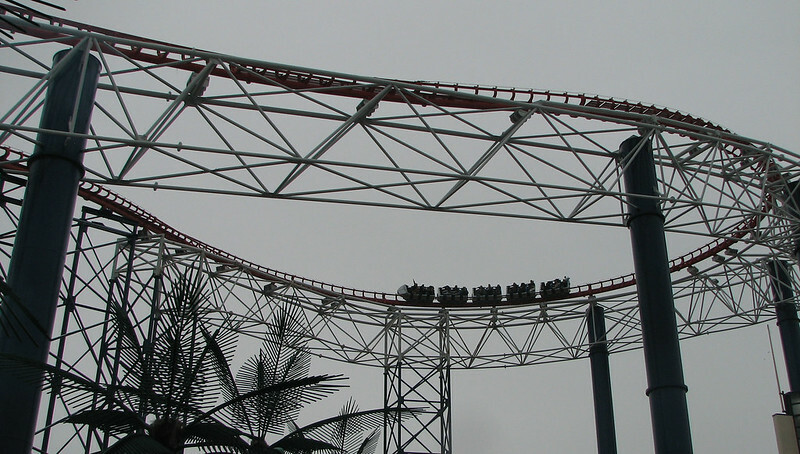 I remember the first drop as being sheerer when it first opened, and you really would get a scary feeling of being launched out of your seat. 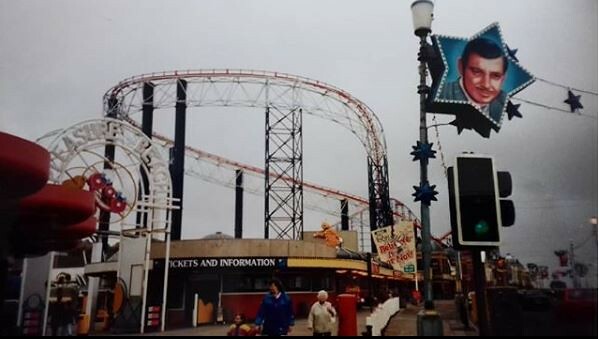 I was working at the Pleasure Beach that first season. A couple of times I saw it get stuck at the top of the turn that starts to bring you in. It took 45 minutes for workers to get riders down, and being that high up for so long must have been fairly unnerving. I mention that because I wonder if these incidents prompted the park to look at the dynamics of the ride and make changes to the first drop. 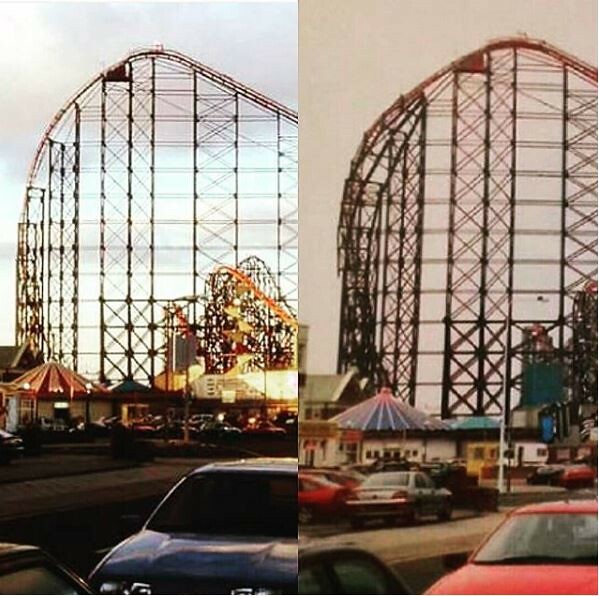 I think they went back and flattened out the bottom of the first hill and added more of a bank to it, which spoiled it a bit and had a knock on effect on the ride elsewhere. They did have that early crash too, and they seemed to be very heavy on the brakes towards the end of the circuit after that occurred. So what started out as a ride with an incredible first drop that was then a bit flat but at least fast, turned into one with an altered first drop, which was braked down to a crawl at the end within the first year of opening. I can't have dreamt all of this, can I? Has anyone got any corroborative memories or information about this? Particularly with regard to alterations to the ride structure on the first hill. Yeah, they've definitely retracked the first drop. But I don't think the ride now is much different to the early days. The first drop was a fair bit different, and it did race its way into the station rather than the crawl you get now. It was just for the first year though. Yeah, the initial Big One drop wasn't significantly adjusted in a way that would have it lose speed at a higher rate. Fairly certain the height and size of the drop was never altered, only the angle and degree in which the track twists. Other profiling adjustments were made to the turnaround section, which was initially much wider. If anything, that section was re-profiled to maintain some speed, as there were some issues with that in the first few seasons. Okay, interesting stuff thanks. The speed issue seems to be at the end of the ride and you go round that 360 degree turn. Is that down to more cautious braking then? The first drop isn't slower than it was, but it feels like less of a vertical drop than previously. It could be the mid-circuit brake run, although the last time I went on Big One (early March 2017) it seemed that the MCBR was less effective than on many rides I have had previously. Other bits were of course used for the entrance signs of Traumatizer and Spin Doctor. Matt N, mouse, Mysterious Sue and 5 others like this. 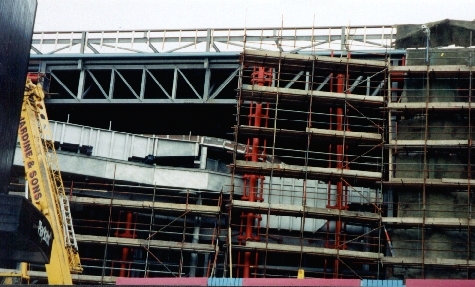 It was also used as the support structure for the façade of Valhalla. vaugc002, Mysterious Sue, sandgrown and 7 others like this. That's amazing! I had no idea. If given the choice I would rather ride the support structure for Valhalla. Mysterious Sue and Lofty like this.